This is one of my favorite lunch toasts. 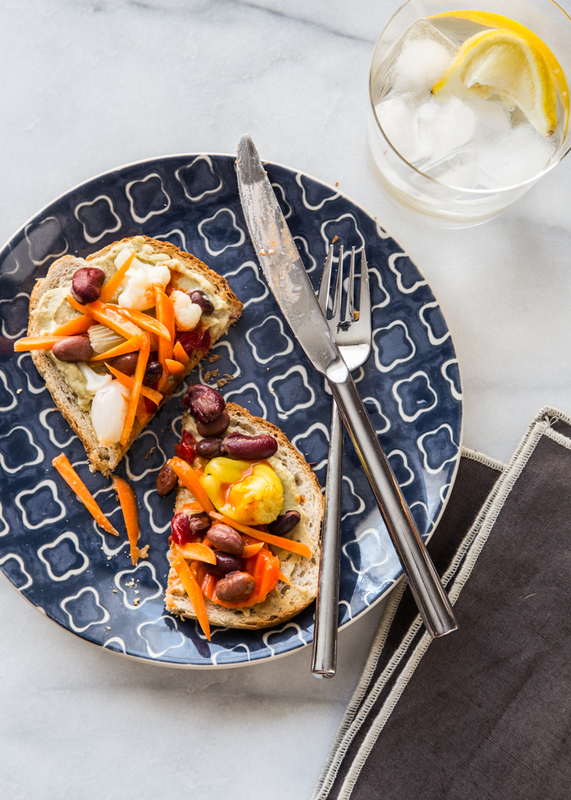 My favorite rye bread toasted and spread with hummus, pickled veggies, carrots and beans. While I’m showing you this combination on toast, in reality, this recipe started as a wrap. Last summer our house got on a huge wrap kick. It was like the 1990’s came back with a vengeance. Although walking through Kohl’s recently has shown me that it’s not just food from the 90’s that I’m into, but clothes, too. Hello, golden boots and backpack purses! It’s like I’m in junior high all over again and it’s glorious. Tell me that I’m not the only one reliving my love of crazy 90’s fashion? It’s highly likely that my lifelong obsession with Friends will forever make me nostalgic that time. Ok, so what the heck does this toast have to do with wraps and flowered backpacks? Well, last summer I started making a wrap made from a tortilla (my favorite Tortilla Land tortillas), hummus, chopped up pickled veggies, beans, shredded carrots and hot sauce. It sounds so bizarre, but I just threw everything on one day in a hurry to make something healthy, but substantial and it tasted awesome! Well, I ended up making this wrap everyday for the better part of two weeks. Yes, I’m that girl who just can’t let something go and I must drive it into the ground until it begs for mercy. In my usual form, I tired of the wrap and moved onto different midday meals. That is, until last week when I was presented with a jar of pickled veggies (Giardinera) that popped into my fridge. I love Giardinera! I was introduced to it by my mother-in-law and have loved it every since. 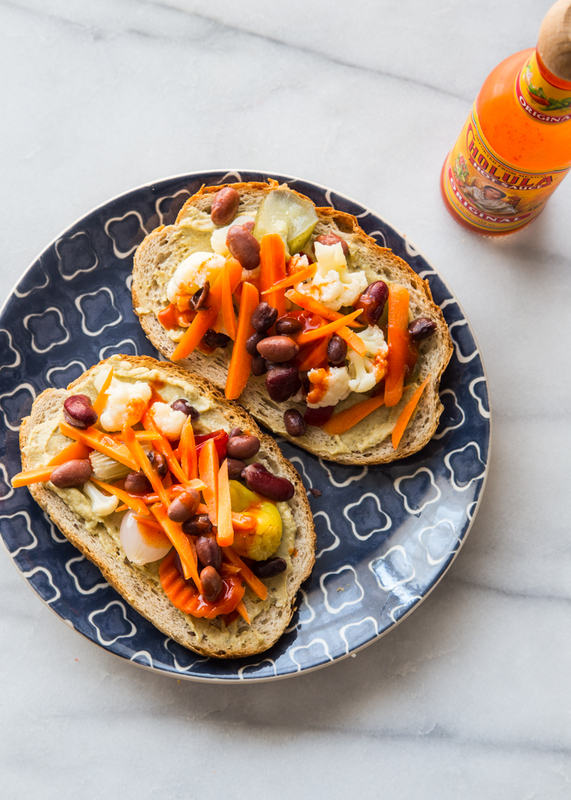 Last week, I decided to revisit my hummus/pickled veggie/bean/carrot/hot sauce combo but this time, I served it up on my very favorite rye toast. It was a winner! 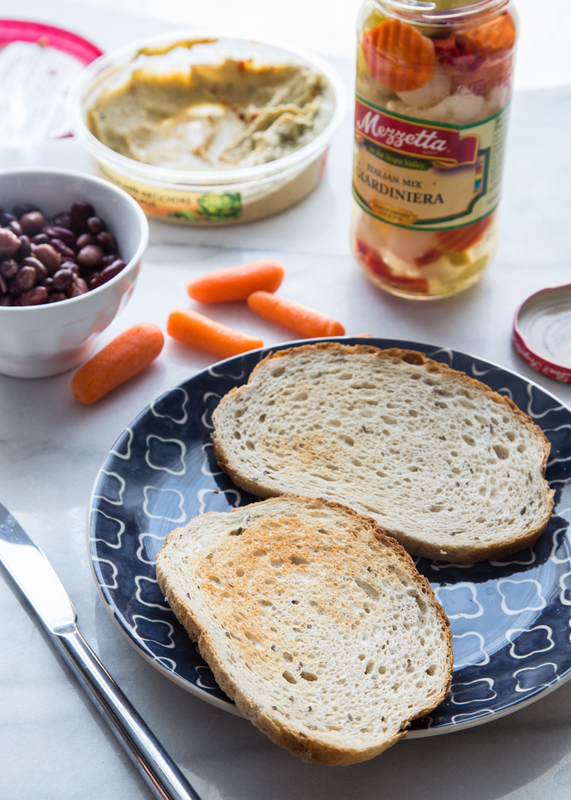 It’s light, but hearty with the hummus and beans with some serious crunch from the carrots and vegetables. 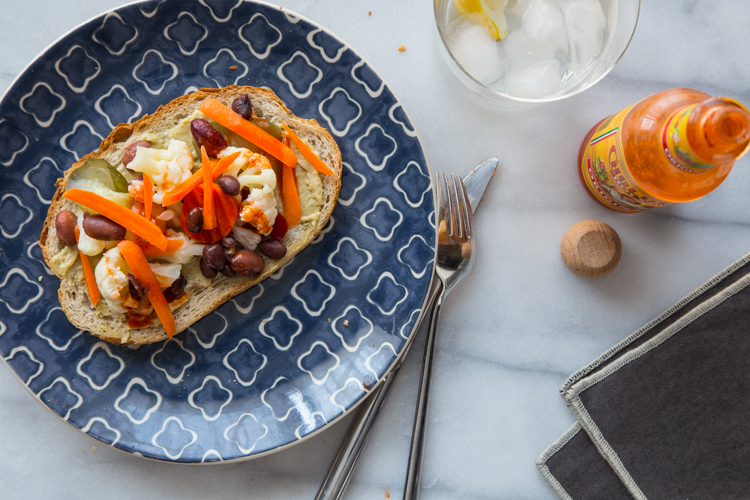 The brine from the Giardinera along with the hot sauce give this toast a serious kick. There are a bunch of different kinds of pickled goodies available at the store so feel free to use whatever you like. I knew this wrap would come around again, but cool and reinvented into a hummus toast. Just like before, but with a bit of a twist. Kinda like the 90’s fashion, right? Spread toast with hummus. Top with pickled veggies, beans and carrots. Drizzle with hot sauce and sprinkle with black pepper. Serve!